Welcome to Disposal Plus Dumpster Service! Family owned and operated dumpster rental business with over 25 years of experience in the waste management industry. We pride ourselves on getting the job done right each and every time. We believe roll-off dumpster rentals should be easy. We offer affordable and competitive rates. Call us, you will not be disappointed! Our Professionally Trained Staff Will Assist in Choosing the Roll-Off Dumpster to Meet Your Project Needs. Family Owned and Operated Company Committed to Fulfilling Our Customer Requests. Affordable and Competitive Pricing to Meet Your Dumpster Rental Needs. 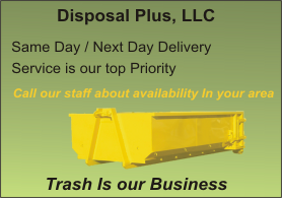 Disposal Plus is your local source for your home town dumpster rentals. Our roll-off containers are perfect for Do-It-Yourself projects, renovation and construction, roofing debris, home clean-outs and more. Call us today for your all your dumpster needs.